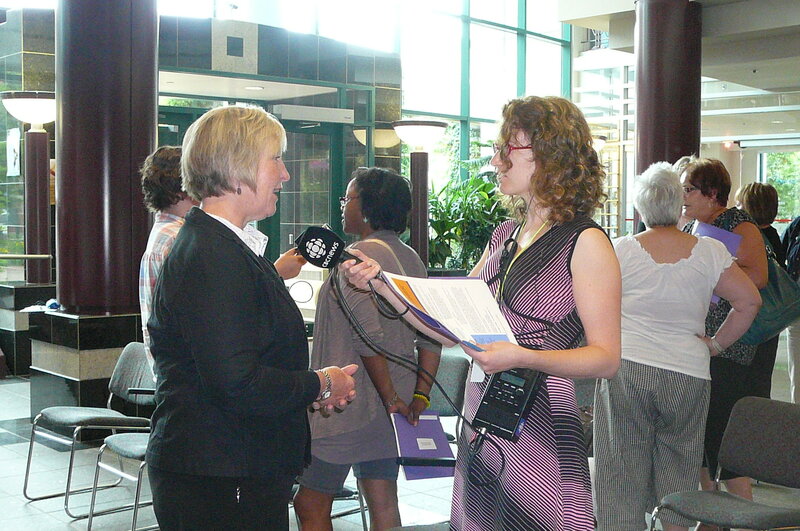 Karen Dunnett, CFUW VP Atlantic speaks with a reporter at the Pay Equity Press Conference in New Brunswick. A few weeks away from the provincial election, the NB Coalition for Pay Equity and seven other major women’s groups and organizations are bringing attention on the need for pay equity legislation for the private sector. The eight groups, representing thousands of women, include the Coalition for Pay Equity, the Canadian Federation of Business and Professional Women’s Clubs (BPW), the Canadian Federation of University Women (CFUW), the Collectif des femmes du Nouveau-Brunswick, the Fédération des femmes acadiennes et francophones du Nouveau-Brunswick, the Institut féminin du Nouveau-Brunswick, the Regroupement féministe du Nouveau-Brunswick and the Women’s Committee – New Brunswick Federation of Labour. “As active and proud participants in the province’s economy, we are uniting our voices to demand a law on pay equity for the private sector”, says a statement signed by the eight women’s groups. “We are calling upon every provincial political party to include pay equity legislation for the private sector in their election platform”, said Marilyn MacCormack, Chair of the Coalition for Pay Equity. “It is time to end pay discrimination for all NB workers”. According to the eight groups, the Pay Equity Act, 2009 which came into force in April 2010 is a positive but insufficient step, since it only applies to public sector employees while 67% of the women in the labour force are working in the private sector. “NB women are contributing to the economy. This contribution must be recognized and jobs mostly held by women must be paid fairly, based on their value to their employers. Legislation for all sectors of the economy is the best way to achieve that”, said Sue Calhoun, Immediate Past-President of the Canadian Federation of Business and Professional Women’s Clubs. Alya Hadjem, Coordinator of the Collectif des femmes du N.-B., also supports pay equity legislation, explaining that many immigrant and visible minority women hold predominantly female jobs in the private sector. Karen Dunnett, Vice-President Atlantic on CFUW’s National Board, and President of the CFUW Atlantic Regional Council, mentioned that the annual wage gap among Canadian university graduates rose from 12% in 1991 to 18% in 2001, due to a drop in real wages in female-dominated fields (health and education) and an increase in real wages in male-dominated fields (engineering, mathematics, computer science and physical sciences). She said that pay equity legislation could reverse this trend. The Coalition and the seven women’s groups said they are going to follow closely the provincial political parties’ platforms. Frenette, M., and Coulombe, S. (2007). Has Higher Education Among Young Women Substantially Reduced the Gender Gap in Employment and Earnings? Analytical Studies Branch Research Paper. Statistics Canada: Ottawa. This entry was posted in Actions and tagged pay equity on August 5, 2010 by cfuwadvocacy.